Another Beautiful Day in Paradise. We had nice clear blue skies, temperatures in the high 80s and almost no breeze. Bladers/Bicyclers Rob H, Dave A, Carol J, Dorey Anne, Jim H & Terri S, Ginnie S & Rick P, Barbara M, Laura P & Breeze, Wilma & Jim F, Bruce M, Jeff B, Steve G, Nick S and (Joe W & Charles C not in picture) came. Welcome all. 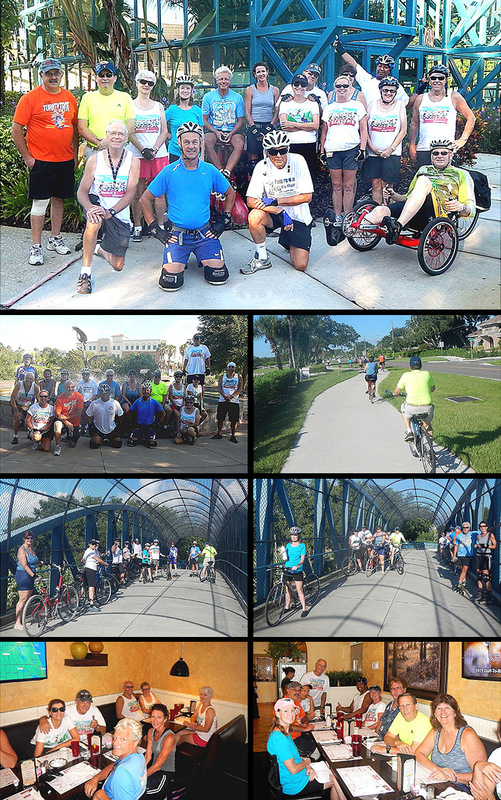 We did our normal Long Center East-West trail to the marina fountain in Safety Harbor and back. It was a little warm but we had quite a bit of shade on the trail. There were 14 bicyclers and five bladers. Almost all did the 10.5 mile round trip. We Brunched at the Sunset Grill as planned. We got right in and seated at one big long table and one booth. Service was a little slow starting. However after a short wait, the service picked up to normal, the coffee flowed freely and the food was exceptional. We had ratings from 9.6 to 9.8. We'll give the Sunset Grill a 9.7.